La Dolce Vita: Foodies Rejoice! Do you remember last month I blogged about Spain...On the Road Again, the show which follows Gwyneth Paltrow, Mario Batali, and friends as they embark on a culinary tour of Spain? Well, it seems that the show has already been picked up for a second season in Italy! Does anyone in Houston know when Spain...On the Road Again will premiere in Houston? I searched my DVR, but couldn't find it and I'm so eager to watch! I live in Boston and it looks like the first episode aired here on Sept 20. Check out www.pbs.org and search for Spain...on the road again there - I think once you find the show you can find local listings by typing in your zip code. Hope that helps! With the boys up early at Madrid's fish market, the ladies lounge luxuriously eating churros and hot chocolate. 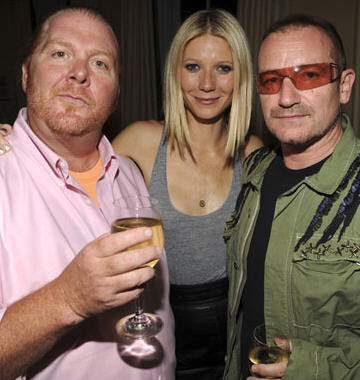 Then Gwyneth and Mario cruise down to Toledo for a cooking lesson with one of Castilla la Mancha's top chefs. Mark and Claudia travel the route of Don Quijote, tilting at windmills and learning how to make Manchego cheese. That night, the group celebrates Claudia's birthday in style. After eating bird sushi, Mario learns that Iron Chefs don't always have iron stomachs. Thank you, Courtney! That episode sounds great. I can't wait!